People can be divided into two categories; too many times over. They can be divided into bad or good, believers or non-believers, white or black, men or women. But when all the venn diagrams of categorizations are exhausted we realise that no two people can be together in all categories at all times. For the purpose of this review, I divide the reading world into those who relate to and love Paulo Coelho‘s book The Zahir and those who do not. I’m making this kind of a general statement after reading a few reviews of this book. Some reviews laud the book, while others diss it. I belong to the former category. Paulo Coelho’s books are largely metaphorical. They delve into the spiritual side of reality. They touch corners that shy away from our routine existence. And that is why I think some of us like his work while some do not. Some of us spend time looking for a deeper meaning and signs to live our lives, while others live life and reflect on their mettle while they were living it. The Zahir is for those who look for meaning. However, that doesn’t quite cut the kind of people who would read a book about a pilgrimage. The book opens with the narrator, an author, realizing that his wife Esther has disappeared leaving no traces and no goodbye note either. What the author first perceives as betrayal slowly leads to understanding of her disappearance and then to the re-discovering of his love for her. When I use the word ‘love’ here, it can mean a whole lot different from what you perceive it to be and that is what this book tells us. While the author tries to accept the fact that his wife has left him without an explanation and with a barrage of questions and speculations to attend to, he nurses a heartache which evolves into a nagging thought and then into a wild obsession. That is why, the book is called The Zahir. In Arabic, Zahir means visible, present, incapable of going unnoticed. The disappearance of Esther and her reasons for leaving him become the fulcrum of his existence. He can’t stop thinking about why she left, who did she leave him for, where she was, what was she doing, how did she arrive at the decision and more. He can’t fathom why a war correspondent wife of his would want to seek such anonymity, or wouldn’t she? He then begins to recall how she used to tell him about feeling alive only on the battle field. His wife’s disappearance becomes his reason for scratching the surface of his apparently polished life and he goes in search of Esther, the meaning of love and happiness, and most importantly, in search for himself. On his journey to find answers to his questions, the author finds himself in a relationship once again this time with an actress. He meets his wife’s friend Mikhail who knows her whereabouts. The author suspects that Esther left him for Mikhail because his reassessment of the past brings to light how his wife had started spending a lot of time with this man from the East. This causes the author to approach Mikhail more closely and when dusts off his assumptions about Mikhail he finds a treasure worth its weight in gold. The quest to find his wife brings a transformation in himself. He wakes up to the lives they were leading; those of infrequent heart-to-heart conversations and seeking company in other men and women. He embarks on a journey of re-discovering the past and simultaneously freeing himself of his history. “Esther asked why people are sad. The author goes to places where his wife worked, meets the people she met and discovers that she used to hand out pieces of blood-stained cloth from a soldier’s uniform only to certain people. Why she never gave him a piece of that cloth bothers him no end. He meets Mikhail frequently. Mikhail brings the author to a meeting where strangers tell stories about the lack of love in their lives. He takes him to meet beggars who explain why they lead lives that they do and the author sees how all the beggars knew his wife. Finally the author travels to Kazakhstan with Mikhail on his final journey—to meet Esther. She has been weaving a shroud for her father-in-law, Laertes, as a way of putting off her suitors. Only when she finishes the shroud will she remarry. While she waits for Odysseus to return, she unpicks her work every night and begins again the following day. Isn’t that a devoted kind of love? Some of the high points of the book are the ones where the author reflects on the conversations he had with his wife when they were together. While I was reading the conversations, I hoped he would feel her loss for what it really was. I hoped he would think of how the afternoons had run dry and he sought company of other women while his enigmatic wife was still around. In one such conversation, Esther asks the author what they call Hans’s Question. And you should find yourself repeating that question all along the book, “Do you think it was always like this?” In fact, you should ask yourself the question long after you’ve turned the last page. Was it always like this? The Zahir awakens the self and rekindles lost love. There is love of oneself, of nature, of humanity, of the skies and of the beloved. The Zahir drips with understanding in the form of stories. Stories that make us who we are. Stories that stay with us long after we’re gone. The Zahir is anything you make it to be and there is only one place you will find it, in yourself. P.S. : All quotes have been taken from the book. Everyone has a Zahir, for bad or for good. Just depends in what it (the Zahir) makes in our life and how it impact others. morir… El Alquimista… some books I have already read. Outstanding! That’s true Yolanda. That’s precisely what the book tells us. I think what we need to do is decide whether it is good or bad. You’ve read quite a lot! Thanks a lot for stopping by Sanjana. Keep coming! Hey, your review is amazing! I got goosebumps! 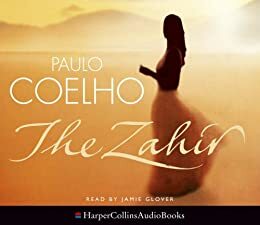 The Zahir is my most favorite from all of Coelho’s books. It spoke volume about relationship and marriage. The time he explained about freedom, 143.5 cm, and many more. I agree that he loves metaphorical, just like most Intuitive Feelers and Thinkers (i’m obsessed with personality types :D). Do you write any book? Your writing is lovely even though it’s a book review, i know you can be an excellent writer!